The five central Asian nations each used to be republics in the former Soviet Union, and all of them have relatively strong ties with Russia. Kyrgyzstan and Tajikistan are candidates to join Russian president Vladimir Putin’s much-feted Eurasian Union, which is meant to be a regional counterweight to the European Union (and also to the economic power of India and China). But Kazakhstan, which is already a member of the Eurasian Union (along with Belarus and Russia), might have the most to fear from Putin’s recent assertiveness on behalf of ethnic Russians in Crimea and otherwise in Ukraine. That’s because Kazakhstan has a much larger proportion of ethnic Russians (around 23.3% of the country’s population of 17.7 million) than any of the other central Asian countries. 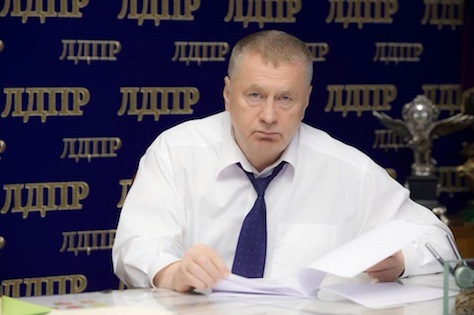 Zhirinovsky is something of an odd character in Russian politics today. He’s certainly part of the opposition, but he’s not nearly the same kind of threat to the Kremlin like Alexei Navalny or other more robust challengers to Putin’s autocratic rule. Zhirinovsky hasn’t been a real threat since the 1995 Russian parliamentary elections and the 1996 presidential election, and he often supports Putin. That makes politicians like Zhirinovsky and Gennady Zyuganov, the leader of Russia’s Communist Party, both Kremlin supporters and a kind of officially sanctioned opposition. Zhirinovsky’s comments, therefore, have caused central Asian leaders to worry — if only just a little. Kyrgyz foreign minister Erlan Abdyldaev late last month called on Zhirinovsky to clarify his views on the matter. So did the Kazakh foreign ministry. “Nursultan Nazarbayev stressed that Kazakhstan, as a strategic partner, treats with understanding the position of Russia, defending the rights of national minorities in Ukraine, as well as its security interests,” Nazarbayev’s press service quoted him as saying in a telephone conversation with Putin. While backing Russian intervention abroad to protect minority rights, Nazarbayev also called for a “peaceful settlement of the crisis in Ukraine on the basis of the preservation of sovereignty in line with the norms of international law,” and hoped all sides would show “restraint” and resolve the crisis through negotiations. The presidents of Kazakhstan and the United States, Nursultan Nazarbayev and Barack Obama, exchanged opinions on key international and regional issues, with the focus being on the situation in Ukraine, during their latest telephone conversation, the Kazakh presidential press service reported on Tuesday. “The presidents of Kazakhstan and the U.S. reaffirmed the need to secure a peaceful settlement in Ukraine with the help of diplomatic methods, which will help maintain the territorial integrity of this country and bridge the gap between the positions of all the sides concerned,” it said. Nazarbayev has served as Kazakhstan’s president since 1991, the breakup of the Soviet Union. If Russia at least has a semblance of democratic institutions (however atrophied since the 1990s), there are no such illusions about democracy in Kazakhstan, where Nazarbayev won his last reelection in April 2011 with 95.55% of the vote. Media is largely censored, and opposition leaders have been jailed in the past. In 2013, Freedom House ranked Kyrgyzstan as ‘partly free’ with a rating of 5 (on a scale of 1, the best, to 7, the worst), and it ranked the other four central Asian states as ‘not free’ — Kazakhstan rated 5.5, Tajikistan 6, and Turkmenistan and Uzbekistan scored 7. Though Uzbekistan has nearly double the population, Kazakhstan has the largest economy in central Asia, due largely to its oil and mineral reserves — oil accounts for nearly three-fourths of the country’s exports and, as a result, Kazakh GDP has grown steadily over the course of the last decade and a half. That’s, in part, why Putin views Russian-Kazakh relations as so important — and it’s why US and Chinese firms are taking an increasing interest in the country as well. It’s notable that Kazakhstan, which borders China’s Xinjiang province, exports just over twice as much to China today than to Russia.